November 27, 2014 – Links International Journal of Socialist Renewal -- Miha Kordiš (pictured above) is a member of the Slovenian national parliament for the Initiative for Democratic Socialism (IDS), a radical left political party, which is part of the United Left electoral front. Miha, could you tell us about recent developments of the United Left in Slovenia? You’ve had national parliamentary elections, the European election and, more recently, local elections. How do you feel it all went? The Radnička fronta (Workers’ Front, Croatia) has been recently founded and often calls itself the "Croatian Syriza". Could you tell us something more about the emergence and program of the Workers' Front? Who are you, how many are you, what do you stand for? The Workers' Front was founded in May 2014 by a group of workers, trade unionists, students, activists and unemployed. Our goal is to create a broad progressive platform, combining the activity of a political party with direct action at the workplaces and political activism in general. At the centre of our mission is the provision of a coherent critique of the capitalist system, and together with other progressive groups, to employ direct strategies against it. We think that a fundamental change of Croatian politics and society is necessary because the capitalist system, which is currently on the offensive in dismantling the remnants of welfare state, is inherently producing inequality, destroying the environment and increasing the ability of rich and the powerful to live off the work of the oppressed and the neglected, while simultaneously diminishing the latter’s ability to influence the political process in any meaningful way. Anti-privatisation protest during United Left Coalition's campaign. July 14, 2014 -- Transform! Network, posted at Links International Journal of Socialist Renewal -- We have broken the vicious circle of anti-communism in the post-Yugoslav context. As you imagine we are more than happy to present you with such an amazing election result! As all the commentators say, the United Left Coalition (ULC) was the biggest surprise. But the path was difficult, the ULC was from early on marginalised by the mainstream. March 19, 2014 -- Links Internaional Journal of Socialist Renewal -- On March 8, the Initiative for Democratic Socialism (IDS) had its founding congress and officially transformed itself into a political party. In the invitation to the congress we have written that in the last 20 years all political parties in Slovenia have been representatives of one and the same fraction, the fraction of capital. We have emphasised that it is high time Slovenia gets a proper socialist party that openly and consciously represents a socialist alternative to both the crisis in Slovenia as well as the crisis in European Union. Mass protest in Sofia, Bulgaria's capital, February 17, 2013. 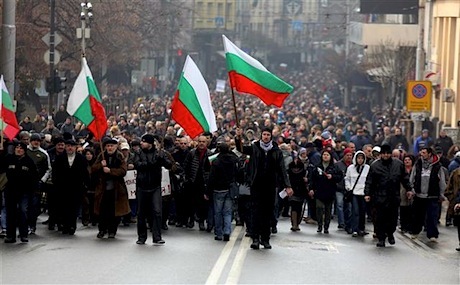 March 15, 2013 -- Left Unity, posted at Links International Journal of Socialist Renewal with permission -- In the last week of February 2013, after days of protests across the country, the Bulgarian government headed by Boyko Borisov resigned. Mariya Ivancheva looks at how it happened and what comes next. From the beginning of February, Bulgarians in most big cities have been out in the streets, protesting against increased electricity and heating bills. While the increase has happened gradually throughout 2012, in January 2013 the bills were considerably bigger than they would normally get. The price formation was transparently written down on the bill, but what angered many is that a significant amount of money was charged not for energy per se but for various taxes and tariffs.